You can use Chrome DevTools on your development machine to debug a web app that is running on a Fire TV device, Fire tablet or other Android device. Connect the development machine and host device using either a USB cable or a WiFi network. Note: The Chrome DevTools, the Chrome Browser installation tool, the Android SDK and certain other development tools referenced on this page are provided by third parties, not by Amazon. Our links for these tools will take you to third-party sites to download and install them. Connect your device and computer using ADB. See Connect to fire-tv through ADB. Install and setup the Web App Tester. See Install and Use the Amazon Web App Tester. USB or WiFi connection between development machine and host device. To use the Chrome DevTools to debug your web app, you must first install the Chrome Browser (version 32 or later) on your computer. Visit http://www.google.com/chrome for download instructions. The Chrome DevTools use the Android Debug Bridge (adb), part of the Android SDK tools, to communicate with the web app from your computer. For more information on using the Chrome DevTools, see Discover Chrome DevTools on the Chromium blog. Connect your host device directly to your development machine using a USB cable. Don't use any intermediate USB hubs. From Web App Tester, click Test to start up the app. On your development machine, enter chrome://inspect in the URL input line. The Chrome browser will display the host device and the running apps. Click inspect to open the developer tools window. You can now use the features of Chrome DevTools to debug and test your web app. Connect your host device directly to your development machine using a USB cable. 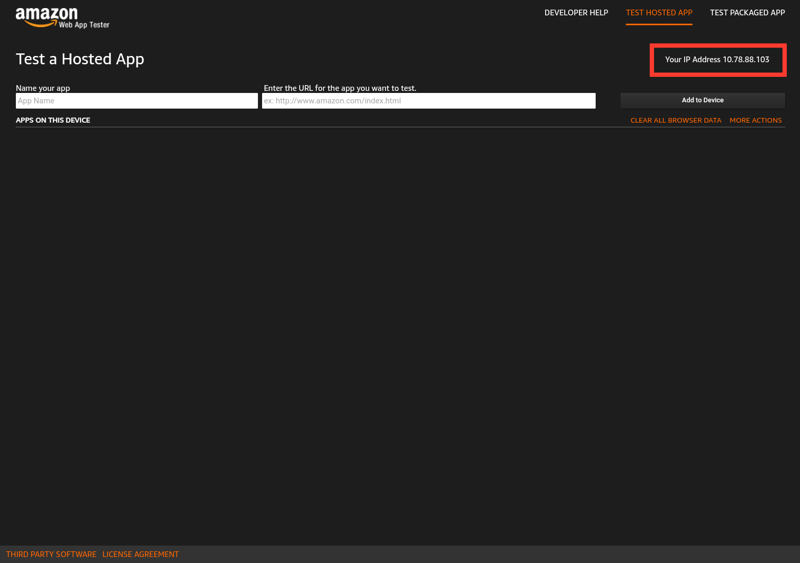 On your host device, tap and open the Web App Tester. On your computer, open a command prompt window or terminal shell and navigate to your Android SDK platform-tools directory. Disconnect your host device and your computer. Ensure that your development machine and device are connected to the same network. The Chrome DevTools will then open a Chrome window in which you can view the code for your web app and debug it as it runs. On your divide tap and open the Web App Tester app. Use the full screen handle at the bottom of the screen to open the Status Bar. This step is necessary only on Fire tablets. On your computer, make sure you are connected to the same network as the device. Open the browser and enter the URL specified in the previous step.